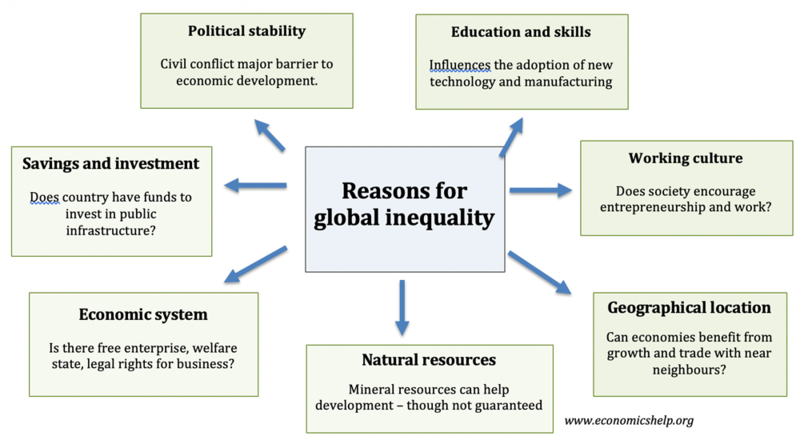 Home > Economics help blog > economics > Why is there so much global inequality? Why is there so much global inequality? There are many reasons for these divergences in income including – historical trends, the existence of natural resources, geographical location, economic system and levels of education. This map of GDP (PPP) Per capita illustrates areas of high and low-income are often in close proximity. What explains this difference in income standards? Levels of education. Countries with low levels of education and skills are generally stuck with labour intensive primary sector. Countries with more skilled labour are able to command higher wages and more capital-intensive methods of production. This explains why countries are have low levels of natural resources are able to become wealthy. For example, Japan has very limited supplies of raw materials, but it’s economic development in the post-war period has been based on manufacturing and adding value to raw materials. Working culture. Countries with strong working/entrepreneur culture are able to promote economic growth and economic development. A success of the Japanese economy in the post-war period was a strong ethos which promoted continual improvement in the working process. This included good industrial relations and motivating workers to take pride in their work. This contrasted with the UK, where in the post-war period there was more industrial unrest, conflict between workers and management and difficulty in bringing in new ideas. Savings and investment. Higher levels of savings enable firms and government to invest in increasing capital and productive capacity. Countries with low levels of savings and high levels of debt, struggle to break out of a cycle of low investment and low growth. In the 1980s and 90s, many of the poorest developing economies faced high debt burdens, with interest payments taking up large percentage of foreign currency earnings – this made it difficult to invest. Tax collection. Some developing countries struggle to collect tax, and as a result, the government has limited funds to invest in social infrastructure – schools, roads, hospitals and transport links. Higher tax collection enables public investment and also a basic welfare state which can support people in periods of unemployment. Levels of corruption. Countries with high levels of corruption and criminality tend to have lower economic welfare. Money is syphoned off to tax havens and the corruption makes setting up new business more difficult. The openness of the economy. Countries which have opened their economies to trade and have good trade links have seen a rise in living standards in recent decades. For example, countries in South East Asia have benefitted from a strong export sector which has led to economic development. Economic system. Countries in eastern Europe slipped behind their western European neighbours in the period 1945-1990 because of the inefficiencies within a command economy. WIth production controlled by the government, there was a lack of incentives and opportunities to develop new business and new product lines. Since, the liberalisation of Eastern Europe and a flow of inward investment and funds, Eastern European economies have made progress in catching up with western living standards. Welfare state. This doesn’t mean more free markets are always better for promoting economic development. Some economies in western Europe have amongst the highest levels of living standards in the world – with a generous welfare state, with the government spending up to 50% of GDP. The extensive welfare state includes public infrastructure, education, health care, pensions and social security. This ‘safety net’ can encourage people to take risks and invest in education and training – which in the long-term can help promote economic development. Natural resources. Ceteris paribus the discovery of raw materials, especially valuable commodities like oil and gas can increase real GDP and enable the potential for more investment and economic development. Middle Eastern economies, with valuable oil resources have seen rapid growth in GDP due to oil exports. Resource Curse. However, natural resources can be a mixed blessing, with some resource-rich countries still with very low levels of GDP. This is sometimes known as the resource curse – high levels of resources can be misused and syphoned off by corruption, but more problematic abundant resources can ‘crowd out’ other aspects of the economy such as manufacturing – which is a way out of low economic development. Primary product dependency. Many less developed economies have economies which are heavily dependent on primary products (especially agriculture) however, this can hold back development for a few reasons. As world GDP rises, demand for agricultural products doesn’t rise that much – combined with an increase in supply can actually lead to falling revenues. There is limited scope for developing higher value-added exports, without investment in capital. Gravity theory suggests trade is influenced by countries geographical proximity and similarities in terms of culture and economic development. Neighbours are more likely to give aid to near neighbours as it is in their best interest to help neighbours to reduce regional inequality, e.g. the EU has played a considerable role in investing in Eastern Europe. Some landlocked countries with no access to seaports will find trade more difficult and expensive. how can economics be used to reduce inequality? what jobs are there that an economics student can do?